The winds are changing and coming out of the southwest. That's usually a good thing as storms from the south historically have hit hard at Powderhorn. Wind gusts up to 55 mph are expected today. When it's this windy, it feels like all our snow is going to end up on people's doorsteps in Mesa. But thankfully the track-packing we did this week will help hold what we have. There's no new snow yet, but the storm is supposed to get going around 11am today. Accumulations aren't high today since it's going to be so windy. But they're still saying 8-12" tonight. 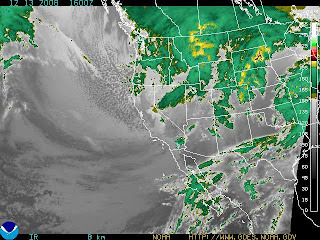 Here's the infrared so you can see the storm. I wish that thing up in Montana was ours! I feel like a weather girl....all I need now is one of those clicky things that change the screen. No snow accumulation yet but the forecasted accumulation has increased! We're looking at 10-16 inches overnight and another 8" possibly tomorrow. yay! I hope PowderHorn opens soon. I can't wait to snowboard this year! I think that they should use some of the snow machines if the storm leaves patches in the snow tonight. how many inches are there so far??? Seriously... Shake that snow dancin booty! AHHHHHH!!!!! ITS SNOWING!!!!! I'm so freaking excited to go boarding fanaly!!!! I re4ally hope powderhorn opens on monday cause that would be the best birthday present EVER!